It is that time again! My July Stitch Fix box has arrived! I'm not going to lie... I was unimpressed at what I saw when I snuck in and looked at what was on its way to me. None of the pieces really caught my eye. Low and behold, they get here... I try them on and what do you know, I'm smitten with two pieces. My quick run down of Stitch Fix. Sign up (AND GET YOUR FIRST BOX FREE). Do a style profile. A stylist picks out 5 pieces to send to you (each month, every other month, once a quarter.. whenever, you schedule it!). You buy what you like, and send back what you don't like. Your $20 styling fee is applied towards any items you decide to keep. And you can even tell your stylist about upcoming events or particular pieces you are looking to add to your closet. I am really not a huge jewelry person these days. I wear my Apple watch, my wedding ring and a pair of studs in each of my ear piercings and that is usually about it. This necklace is awkward. It has an adjustable sliding closure which makes it so you can wear it short or long, but the actual material of the chain itself makes that function super clunky. It was an easy decision to send this one back. I wanted to like this shirt but I'm really not a fan of the pattern. I have a few sheer shirts already in my closet as well. So another easy return. I wasn't sure of this print or style when I first saw what was headed my way. But I am honestly a fan. I have been gravitating towards florals as of late and a shirt like this can be dressed up or down depending on my needs. This one is a keeper going into fall (maybe someday the temps will start to cool their roll just a bit), especially because it is fully lined. I can't y'all. This shirt is TERRIBLE. It reminds me so much of a shirt my dad would wear (sorry Dad! Nothing against these shirts on you... just me). And not in the male clothing on women is in way. I think this was sent to me because I mentioned that I was heading to a Shania Twain concert next week. Obviously country music and denim are a thing. But no. I knew this one was going back from the minute I pulled it out of the box. I LOVE THIS DRESS. I truly feel like it cinches in at just the right point. My only reservation is that it is a fairly simple unlined dress for $68. Maybe this is what people pay for clothing? I'm not sure. But to me it seems high for the material. I am woefully sending it back. So I am two boxes in. What are my thoughts now? I am so used to paying Target clearance rack prices for the clothing that I wear, that I am still struggling with most of the price points. Which is unfortunate because I would probably keep a lot more if it were not for the price tags. I still love having someone else shop for me. But I am probably going to bump my boxes back out to every other month or more so that I can not feel so much guilt about keeping multiple pieces from each box. Let's be real... cruising the Target clearance racks this evening I came across a shirt I LOVED for under $10 (Knox Rose brand, anyone?). I feel zero guilt adding a shirt to my cart when it is priced so low. But I am really struggling justifying the price points on some of these pieces. 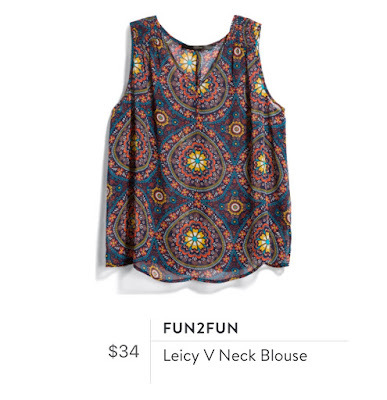 Anyway, if you joined Stitch Fix - what are YOUR thoughts? And remember... you get your first box for free if you use my referral link! Thank you! I really liked it too.. I just can't justify the price tag for the quality! I've done stitch fix a couple of times and I've also been underwhelmed. I feel like a lot of the clothes are unlined/not super great quality and expensive. The few items I've kept, I've ended up donating to charity not too long after. I have usually kept one item so I didn't let me styling fee go to waste. For my birthday, I got a code for no styling fee and I ended up sending everything back! I love the idea because I really don't like shopping, but it just doesn't work for me. I have friends who love it and sometimes keep all of the pieces though, so maybe I'm not communicating what I like? It is hard telling. I totally agree with you on the quality versus price part. I am struggling with that big time. So far though I feel like my stylist has really nailed it with 2-4 pieces in my box. I just think it is a lot of fun.. so I will keep going with it! Interesting to hear other feedback on it though. Love that dress! I agree with the prices. Having worked retail, I basically refuse to pay full price for clothes. Stitch Fix has cute stuff, but I am not interested in spending that kind of money on clothes. I totally get that. I am the same way. When I buy clothing in person I never purchase something full price. So that is what I think I am struggling with the most when it comes to these boxes.